The Volvo S60 has a lot to offer you, especially when it comes to the audio and technology. 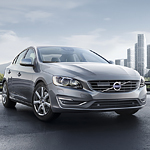 At Volvo Cars of Evansville, we’ll show you why this is such a popular luxury compact sedan. Depending on the trim level, you can look forward to a 9-inch center display with touchscreen. It is also fully compatible with Android Auto and Apple CarPlay, allowing you to use voice commands for playing music, getting directions, making phone calls, and more. The graphical head-up display also makes it easier to get pertinent driving information without taking your eyes off the road. Listening to music, podcasts, and more will be exciting in the Volvo S60, too, thanks to the premium sound system. The Harman Kardon system comes standard. Plus, you can choose to upgrade to the Bowers & Wilkins system should you desire.